King Louis XVI of France was captured in June 1791 while escaping his country. He was stopped at an inn after trying to pay with a coin that had his face in it. Why argue about knife throwing when you can ask Adam and Jamie? I've never really made it a point to watch that. Its not that bad of a show, you should look into it. Okay, so some interesting information about nuclear power plants. So, when a nuclear power plant needs to shut down in an emergency, keep in mind this is exclusive to nuclear plants, it goes through what is called a SCRAM drill. Whats that stand for? Well, it actually stands for Safety Control Rod Ax Man, I'm serious people. When nuclear plants were first being developed in the US, they had to have an emergency shutdown to prevent a meltdown, now its done by machines but back in the 50s, they didn't understand radiation, so they had control rods (I'll explain those later on here) hung over the reactor by clothes line and there was a dude who's job was as follows, stand by in case of emergency with an ax so the rods will fall in. So, that was a real deal job, and it paid well. HOWEVER, everyone who DID that for a living, died a slow painful death by cancer years later. Control rods work by the following, as excess electrons are given off by say, plutonium, control rods have the property to absorb the excess electrons, meaning that instead of YOU getting killed by radiation, they take it in saving your life, in a SCRAM drill the rods (now lowered by machines) are dropped in place, there are always rods in place to prevent the reaction from going ape but in a shutdown a LOT of rods are lowered in, enough to slow the reaction down to a crawl. Now, on to Chernobyl! Specifically, the Russian reactors, now, the Soviets used to use a different setup, during the disaster at the plant the core was super heated to the point where it melted through feet of concrete and graphite, landing on the ground below. To prevent further disaster, volunteers threw sand onto it without and kind of containment suits on, and they succeeded in stopping further disaster, at a cost to their own lives, actually, out of all of the first firefighters to get on the scene, only one lived to see the 1980s because they were on roofs, carrying material contaminated with radiation, fighting fires, ectera, without suits or training with nuclear materials. Aldo, the used rods in a plant in the US, when they are officially classified as "spent" are at 80% power, that's when they are scraped, and, fun fact, they last for 3 months. A reactor goes offline for a bit, than is sealed for 3 months strait, think about that. Forty-nine states in the US allow their citizens to carry handguns. However, throwing stars are verboten to carry in every state but New Hampshire. Because throwing stars are EVIL! And they are used by NINJA ASSASSINS! JUST LIKE IN THE MOVIES! And that kind of leads to more useless information to explain the one state listed above: New Hampshire ditched its knife laws a few years back when they realized, "Hey, these laws aren't doing anything." Now their knife law is pretty much, "Knives are illegal to use in a crime," and people who violate it are hit with extra jail time. The common sense! It burns! Federal law dictates that switchblade knives must ship to an authorized dealer, not an individual, unless a) the blade is three inches or less, and (b) the individual has only one arm. I kid you not. Useless gun fact, Beretta, the Italian manufacturer of some top notch shotguns and handguns (however, their rifles lack in quality a bit bu comparison) is the oldest currently running firearms manufacturer in the world, founded in 1526. On a related note, they make nice shooting clothes. Wow, it's surprising to realize guns have been around that long. I mean, I would've known that if I thought hard enough about it, but still, I didn't line up the history in my head. Indeed, old matchlocks I'd assume, actually, the first guns were these small cannon things on sticks, you would stick a burning piece of cloth into the touch hole and hope to hit something, also the first projectiles were arrows. I'm pretty sure that the South Carolina law about carrying a knife says that the the blade can't be any bigger than the palm of your hand. I do like what knife companies have done about the switchblade law. They've all made what they call, "Spring Assist" which is basically the same exact thing, but instead of pushing a button to release the blade, you do something like pull down a tab, pushing the blade out a little and letting the spring take over, or just giving the knife a little flick-of-the-wrist. You can still get a switchblade, but if you want to do that legally, you have to have some kind of credentials, in other words, you have to be in the military or some type of national defense. Also, I find it funny how this thread turned into a discussion about defensive tactics ans weaponry. You keep a throwing star with you? You must be an EVIL NINJA ASSASSIN! But seriously, as long as you're just keeping the thing in your car, you should be fine. I just can't get over the fact that (if you're 18 in NC) you can walk around with a LOADED PISTOL on your hip, but God forbid you have a throwing star! Also, I find it funny how this thread turned into a discussion about defensive tactics and weaponry. Well, to be fair, oddball weapons like throwing stars pretty much epitomize combat uselessness... so I guess pretty much any information about 'em would also fall under the category of "useless." As an aside-- not to ruffle any feathers, but knives and martial arts aren't far behind shuriken in that spectrum of uselessness, actually. With a gun, I can have only one functioning arm and one functioning eyeball and/or have taken a whack or two to the ol' noggin and/or be on the ground and still capably defend myself. With my fists (and yes, I do take karate) or a knife, I'm screwed under the same circumstances-- or if my opponent has something like a baseball bat, outnumbers me, is a lot bigger than me, etc. Same goes double for my smallish mother. Useless fact: Almost 1,000 people are beaten to death (with fists-- this doesn't include clubs, bats, etc.) each year in the USA. The oldest family-owned company listed has been going for forty generations. Holy cow. Fun food fact: Many Chinese shrimp are raised in sewage. Mostly treated sewage, but still. The average poor American is far more likely to have stuff like a car, TV, refrigerator, A/C, etc. than the average European (wouldn't have figured that). France has extremely strict laws governing food description and labeling, so as a consumer you always know exactly what you're buying. Artificial strawberry flavor is different in Europe than in America. Paracord contains four small strands of monofilament line at its center. Four out of five dentists don't actually give a **** what toothpaste you use. Musical instrument cases are a wonderfully low-profile way to move firearms from your house to the car for a range trip. The effect is especially humorous when you get drum cases, a bag for an electronic keyboard, and a guitar case or two all heading out the door at the same time. Pasta is best rinsed immediately after draining to keep it from continuing to cook. Aviation gasoline (avgas or 100LL) is a beautiful light blue color, and leaves behind virtually no odor or reisdue once it's evaporated. Jet fuel, on the other hand, isn't refined much more than diesel fuel. Last edited by GunRacer on Thu Jul 12, 2012 11:58 pm, edited 1 time in total. Using jet fuel in a vehicle will slow it down because it burns a lot slower but with more energy, unlike gasoline which burns quickly, but not completely. Nitrous Oxide actually doesn't burn either, it actually is cold enough that it condenses more oxygen into the fuel mixture, leading to the car going faster. Stars, throwing knives, etc. If your in a combat situation, either get a gun, learn how to fight, or just run. Cuz if you throw something at them, you just lost your only weapon, and gave them a weapon, and a greater reason to use it. WWII aircraft engines very often used Water Injection. Injecting water into the intake cooled down the mixture allowing more fuel, plus it prevented knocking and preignition, enabling higher compression ratios, giving more power and efficiency. Assuming you don't have warrants or aren't driving a stolen car, this pretty much only happens when you're a jerk to the police officer. Unless, of course, you happen to live in NYC. On the topic of WWII aircraft, early versions of the Spitfire (Britain's premiere dogfighter) were actually carburated. Many Luftwaffe pilots would, when tailed, simply push forward into a dive with their fuel-injected Me-109s or Focke-Wulf 190s. The British pilot would have to roll over and then pull back on the stick to follow, so he wouldn't choke out his engine. This bought the German pilots some time and distance. I have a Swiss army knife, simply pocket knife. And I always wonder, would Swiss soilder stab enmey with pocket knife? Would they? I would hope not, because the ones that I've seen have something like a two inch blade and would be less than useless in a combat situation. No, because the Swiss have no military. The Swiss have a different defense in place, everyone between the ages of 25 and 50 is given basic military training and a Sig Sauer 552 assault rifle, plus with the national sport being shooting the Swiss are a force to be reckoned with. That's not the only defense. With mountains all around it, Switzerland is incredibly difficult to invade, and someone would have to be insane to try. So naturally, Hitler wanted to invade the place in WW2. Did he? I'm guessing he might have considered it, but from my understanding he certainly did not attempt to invade Switzerland. In fact, although Switzerland was technically neutral throughout the war, they were economically beneficial to Nazi Germany. Nazi Germany even used Switzerland's banks, I believe. Everyone used the Swiss banks, also in WWII people in Switzerland would take rifles and sit on the border to keep them Nazis back. Jim Carrie is a big death metal fan, and the reason for Cannibal Corpse appearing in Ace Ventura Pet Detective was because Carrie is a big fan of theirs. Begian born Surrealist Rene magritte was a communist. He's one of my favorite painters! it's a guy with an apple in front of his face. Who would think it's a pipe? Lies, there was scotch tape involved! There was a DC superhero named Danny The Street, Danny was a sentient stretch of road, he had a few powers, he can teleport to anywhere, intagrate into any cityscape without disturbing anything, the city moves to accommodate him, and he can communicate through the written word. Danny travels the world looking for children who are lost, homeless, or in need of friendship and gives them a place to stay. He as a member of the Teen Titans until sacrificing himself to save the rest of the team from certain death, and it is implied he lives on as Danny The Alley, but is still assumed dead. Goodnight, sweet prince, the world will mourn your loss till the end of time. 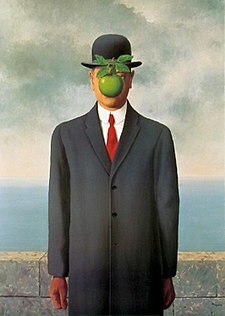 Honestly I had no idea who he until I went to the Magritte museum in Brussels this weekend. In the Netherlands it's tradition for the birthday boy/girl to bring the cake to their party. I kinda did that last year in band. In 1887 was invented a language called Esperanto. It's goal was to be easier than Latin and because it was created from many words that were taken from various languages (mainly European), easier to be learned and used as universal international language. However, that plan never succeeded since commonly for international communication was used French and then English. The plant that the banana grows on is actually an herb. The banana is a berry. Pumpkins, botanically speaking, are actually a fruit. Dueling is legal in Paraguay for registered blood donors. A jiff and a moment are actual units of time, equal to 1/10th of a second and 1.5 minutes respectively. 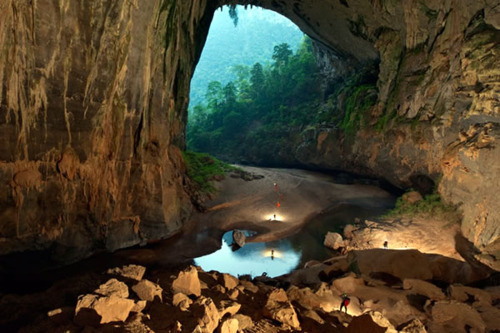 There is a cave in Vietnam so big that it has trees and clouds inside of it. Also, I totally want to see a picture of that cave in Vietnam. The dye used on the British army's "red" coats was made from dead cochineal bugs. It's true. Well, maybe they don't actually "walk", but they do move up to 15cm a year. The largest living organism is a mushroom in Oregon. Mussolini loved jazz. His son became a well known post-war jazz musician. Hitler wanted actor Clark Gable dead or alive. Soviet filmmaker sergei eisenstein was a huge Chaplin fan.